Coming to Baracoa? 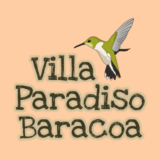 Want to book at Villa Paradiso? You can use this form to request your booking. We will respond to you as soon as possible. We’ll be delighted to host you at Villa Paradiso!